This case demonstrates how ongoing ethnographic research from within a corporation led to the re-segmentation of a market. The first part of the case focuses on how a team of social science researchers at a major technology company, Intel, drew on past research studies to develop a point-of-view on the increasing importance of content creation across a range of populations that challenged the findings of a quantitative market sizing study. Drawing on earlier qualitative work, the team was able to successfully argue for the value of ethnographic research to augment these findings and to show how research participants’ orientations toward technology constituted a more significant, and more actionable way of segmenting this new market than professional status, the differentiator used in the quantitative study. The second half of the case highlights the process of driving business change from within a large corporation. By turning an ethnographic eye on their own organization, drawing on past research, and by sharing unfinished results in workshops to grow the project in phases, the team was able to build stakeholder buy-in, and prime the organization for more ready adoption of ethnographic insights. As a result, the team's findings led to a substantive change in Intel's perspective on digital content creators, and to new products and marketing strategies. The team won a divisional award for defining a strategy that led to a profitable growth area for the corporation. This is a story about the value of cumulative ethnographic work from within an organization, the role of ethnography in shifting the perspective of internal corporate stakeholders, and driving impact with a new segmentation. With increasingly powerful computers available at lower and lower prices, the shift in processing from client devices to cloud and data centers, and the gradual approach toward market saturation, Intel was increasingly concerned with declining sales in the desktop market. In an effort to shore up that business, Intel had been trying to identify new markets for whom high end computing mattered. Some members of the Desktop Business Unit saw a potential in marketing to digital content creators, but they did not know how to go after the market. Intel's corporate Market Research Group determined through quantitative research that because they had similar technological needs, and because many of them also played video games, digital content creators were essentially the same as video gamers, and could be reached with the same products and marketing materials. They recommended using a segmentation based on professional standing – professionals, prosumers (enthusiastic hobbyist creators who purchase devices that are close to professional-grade in complexity and quality), and mainstream (casual creators, who use low cost equipment to create basic projects) – to reach the market, with computational needs roughly distributed by status. By their thinking, professionals and prosumers used higher-end computers, and mainstream creators used lower-end machines. They advised the Desktop Business Unit to focus their efforts on mainstream consumers, people who take photos and videos of soccer games and birthday parties, for instance, because while they had lower computational needs, they were also the largest market and would, therefore, result in the highest sales numbers. The Pathfinding Team, composed of social scientists located in a different Intel division, became aware of the interest in content creation within the Desktop Business Unit, and perceived a gap they were in a unique position to fill. Like the Desktop Business Unit, they had observed the increasing centrality of digital content creation in both professional and consumer contexts. Drawing on research done in prior months and years, including research conducted ten years previously about what was then called user generated content, (Faulkner & Melican, 2007), the Pathfinding Team had begun to discuss key behavioral shifts in content creation, and were tracing some of these across diverse research projects unrelated to the Desktop Business Unit. The Pathfinding Team had recently conducted a series of studies on professional creatives, Gen Z (the generation born in the mid-1990s to today), and solopreneurs (similar to entrepreneurs, but with a stronger focus on working alone or with a few partners, as opposed to hiring and building an employee base). These projects had been borne out of requests from other business groups and stakeholders, and in some cases were small explorations driven by the team's own agenda of understanding emerging socio-technical relationships and their relevance to Intel. The Pathfinding Team recognized the market research segmentation based on professional standing as insufficient to address the needs of the Desktop Business Unit, and perceived distinct differences between their own observations and the market research recommendations. They saw computational needs distributed more in terms of complexity of project, for example, than professional status, and doubted that digital content creators were satisfied with the industrial design of laptops and desktops that catered to the video game market. Since part of the goal was to sell more high-end desktop computers, and given the prevalence of phone and camera based editing among casual, and even some semi-professional photographers and videographers, reaching out to soccer moms and dads, even if they were avid picture takers and video makers, also seemed ill advised at best. The Pathfinding Team approached the Desktop Business Unit, armed with evidence from their prior and adjacent work, and a point-of-view on the shifts occurring in digital content creation which became the basis for the Unit's decision to sponsor ethnographic research, first in the US, and later in China and South Korea. The insights generated from this work led to an entirely new and more actionable segmentation rooted in contextualized user behavior that reshaped Intel strategy, motivated new partner projects with Original Equipment Manufacturers (OEMs), and drove new marketing initiatives. Market segmentations hold a powerful position within companies to shape business strategy and key decisions. Prior to the 1960s, companies had largely understood markets in terms of affordability, with luxury brands aimed at higher income consumers, and lesser models with fewer features offered at lower prices to lower income consumers. However, a 1958 article by Pierre Martineau argued that social classes differ profoundly in how and where they buy, not only along economic lines, but also in terms of symbolic value (in Cohen, 2004; 238). By appealing to narrower subgroups within a mass market, companies aim to link their brands not only to the practical needs of consumers, but also to their identities and sense of who they are as people. Where successful, market segmentations can be extraordinarily powerful. Today, segmentations are typically owned by market research teams at corporations and are generally created by clustering attitudinal responses to questionnaires in order to identify different target groups of consumers (e.g. Flynn et al., 2009); these segments are then used to determine prioritization of different features and to inform decisions about the product design and marketing approach. Such methods are effective in that they reduce complexity in ways that make them easy to grasp and use as a framework. However, this same reductive quality can lead to misguided decision making and is often in tension with ethnography, with its attention to complexity. This case study brings another perspective to the relationship between market segments and qualitative insights about people, demonstrating the capacity for ethnography, as Marta Cuciurean-Zapan argues, to enable new kinds of representations (Cuciurean-Zapan, 2014). Further, it demonstrates the value of maintaining ethnographic capabilities within the corporate structure in supporting such interventions by providing the necessary internal knowledge structures, and identifying pivot points out of prior research that would not be possible when research is sourced from a variety of ad hoc sources. This case study traces the process through which the Pathfinding Team identified a critical research gap, created the opportunity for an ethnographic intervention, and executed the study, leading to a series of new insights and ways of thinking about digital content creators as a market. The case study subsequently addresses how the Pathfinding Team worked with the Desktop Business Unit to represent the insights in ways that were both accurate from an ethnographic point of view, and relevant and actionable for the corporation's business partners. Finally, the case study reflects on the impact of this project, and the factors making that impact possible. Initially, the Desktop Business Unit was not fully aware of work taking place in the Pathfinding Team relevant to the topic of digital content creators. They were, however, struggling to figure out what to do with the corporate market research findings that were not clearly actionable. While that work divided the market of digital content creation into segments based on professional status, and time spent engaged in content creation activities, it did little to point toward what matters to content creators, and the factors that shape their computational needs or purchase decision-making practices. We approached the who ran the Desktop division with the desire to do limited pilot ethnographic research in the US because we believed that the work, along with secondary research, could provide an initial perspective on digital content creators that would give us, and the Desktop organization, the basis for making a decision on whether or not there was a potential opportunity with this particular population. This evidence, presented to the head of Intel's Desktop Business Unit, showed that major shifts were happening in the realm of digital content creation, and it became the basis for the Unit's decision to support an initial research phase in the US. The Pathfinding Team was asked explicitly to return with more than “stories about people.” The business unit wanted actionable recommendations. The Pathfinding Team responded to this request by using stories and insights generated in that first phase of research to create an initial differentiation of content creators in terms of their orientations toward technology, including their interest and willingness to delve into technical details of hardware and software. The insights generated in that first phase led to an expansion of the project to include ethnographic research in two additional countries, a business ecosystem analysis that looked at the start-up activity around digital content creation, and a small online survey (n=150) on computing platform preferences designed to validate and support the ethnographic data. Eventually, the work resulted in an actionable market segmentation of digital content creators. This paper focuses on the ethnographic research portion of the study. After gaining the go-ahead to conduct a qualitative research project, the Pathfinding Team decided to focus their research on professional content creators – people who earned a living, or were trying to earn a living, through creating and distributing content, and on young Gen Z creators working toward making a name for themselves in digital content creation, some with professional aspirations, and some for whom the value lay elsewhere. The team defined digital content creators as people who make creative assets, mostly with a visual component, requiring high computational power. Representative job roles of this type of creation include filmmaker, music producer, and multimedia professionals (such as virtual reality & video game artists). Since the goal of the Desktop Business Unit was to sell more high-end, compute-intensive PCs, the decision was made to concentrate on people who need that type of machine in order to do their work. The Pathfinding Team conducted research first in Los Angeles, and later in Shanghai, and Seoul. Los Angeles and Shanghai were chosen as field regions because they attract a wide array of creative professionals, and have strong infrastructures for supporting creative work. In recent years, Seoul has come to be equally recognized as a global influencer of pop culture and creativity, but its selection was driven at the request of the Desktop Business Unit who had a business interest in the region already. The regional and cultural differences helped identify key pain points that spanned across the professions, and provided insights into contrasting purchasing behaviors. The team interviewed 55 participants: Los Angeles (n=21), Shanghai (n=18), and Seoul (n=16). This sample size was necessary to produce a diverse range of experiences, drawing from professionals who identified their primary work as follows in the list below. Across all of the regions, the Pathfinding Team was specifically interested in understanding the perspective of creators who need to make their own decisions about the technology they use, which resulted in a focus on sampling solopreneurs. A solopreneur is an individual who combines the flexibility of freelance projects with the structure and brand building of someone who operates their own business. They work alone or in very small (under 10 people) companies, and have to act as their own information technology (IT) department. This type of professional was of primary interest because they necessarily focus on both the creative production of their work, and the best tools, technologies, and resources to support their endeavors. This is in contrast to creative professionals who are employed at a medium to large company that sets up the IT infrastructure and provides the financial investment in the equipment on behalf of the worker. To be included in the study, research participants needed to use a laptop or desktop computer they selected themselves, and they needed to make money from content creation. The team was not looking for hobbyists. In each site, the team also sought out Gen Z (aged 12 to 19) content creators who were trying to generate value out of their creations – either social capital or monetary compensation. The team included Gen Z participants as they wanted to better understand the relationship between the behaviors and concerns of professionals, and those of young people who were serious about content creation but not - or not yet - professionals. Participants were recruited using snowball sampling methods which included reaching out to content creators participating in online meetup groups, contacting media professors to refer former students, and posting recruiting advertisements on professional networking sites such as LinkedIn. For Shanghai and Seoul, the Pathfinding Team relied heavily on the personal networks of their fieldwork partners because without a one-degree of separation connection there would have been deep skepticism and mistrust by potential participants as to the legitimacy of the request. The Pathfinding Team conducted three-hour ethnographic interviews with participants at the primary location where they work. For most of the sample, this was either their home (sometimes with a specific home office area such as in Figure 1) or in an office building. One participant specifically sought out hotel lobbies that he found architecturally interesting to use as a backdrop inspiration for the theatrical stage models he digitally crafted. The interviews followed a similar structure of having the participants talk through their personal and educational backgrounds related to their profession, and a project demonstration or set of work examples that showcased their workflow and process. In-depth, open ended conversations covered the level of computer processing power creators needed, the types of software applications they use, and how they came to make those determinations. From these areas of focus, the team gained a deep understanding of how independent digital content creators think about the role of technology in their work. Figure 1. 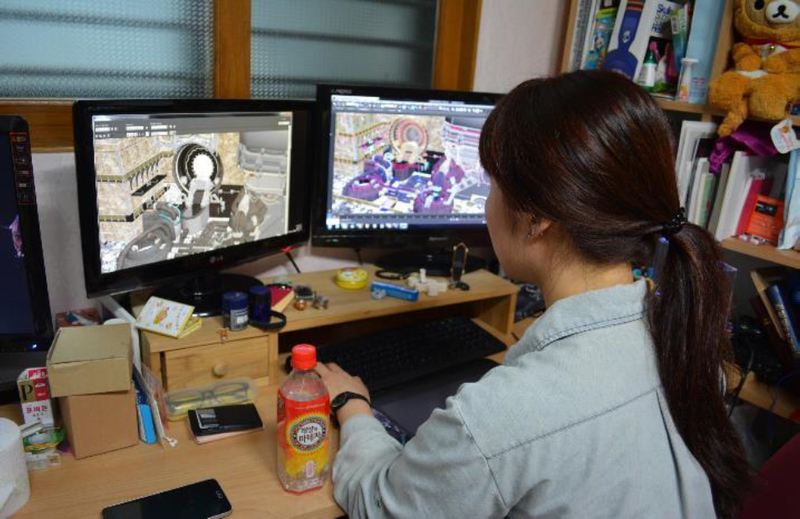 A game developer who aspires to create virtual reality worlds in Seoul, South Korea.